I had my follow up appointment today with an orthopedist. I still don't need surgery (yay!) and I am allowed to start putting weight on it in preparation for walking in my snazzy Terminator boot. I finally feel like life might be getting back to normal soon. Sorry I don't have more of a post today, but I am a little wiped out from getting around. Crutches are not easy to deal with. Luckily, my hubby rented me this great knee scooter. 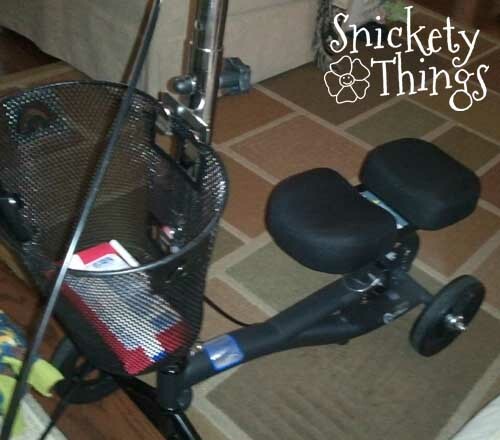 I can get around much easier on it and it doesn't make me feel like I will constantly fall. Not a great picture, but I only have my phone near me to take pictures. I also hope to getting my craft on before long. Glad your husband rented you one of those scooters...at college I saw them a lot with students who had leg injuries and it seemed to make a huge difference in their abilities to get around campus. 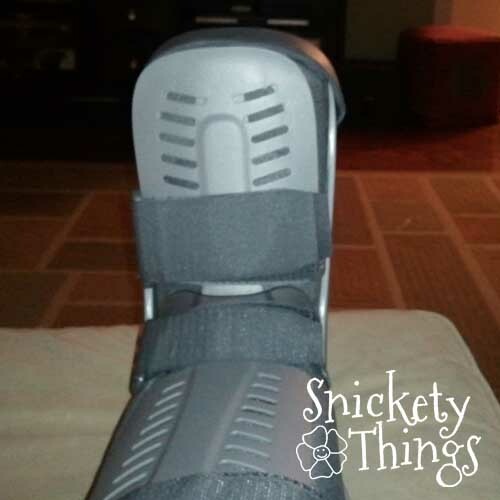 Have fun with your terminator boot! The scooter is great, I would not be able to get around without it. I am glad you won't have to have surgery! Aren't you pretty close to the Gulf? I wanted to check in and see how my fellow Mississippians were doing! Stay safe!! Thank you Shelley. We are getting some rain but so far it isn't bad. It will get worse as the storm goes on. I am updating on the Snickety Things Facebook page as things progress and may make a few tweets from @snicketythings.